The Five Napkin Burger Lives Up To Its Name, But Is That A Good Thing? 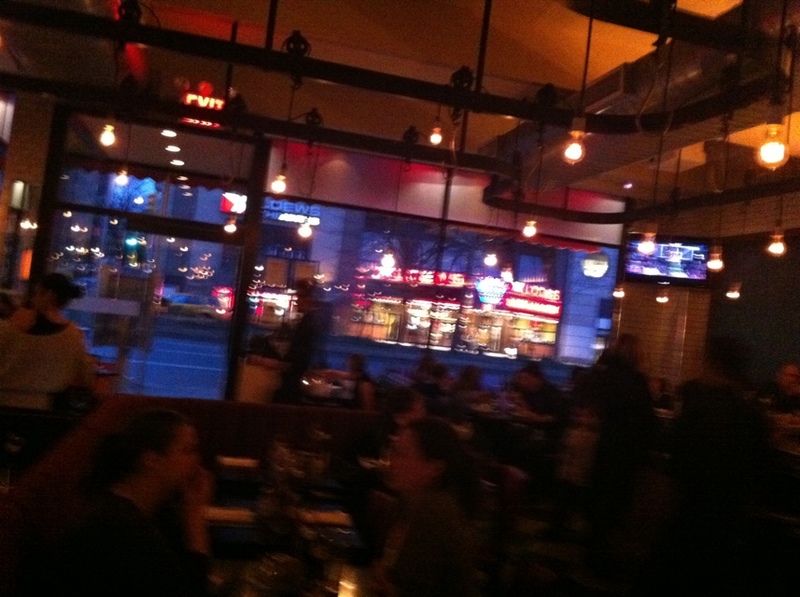 The Upper West Side location, uncharacteristically empty(ish). Much has been made about the explosive growth of the Five Napkin Burger chain. What started as a menu item at Nice Matin on the Upper West Side has spawned a series of burger places across the city. While Mel’s is now (by far) the best burger on the Upper West Side (ok, Morningside Heights), Five Napkin’s 84th street location drew me in to revisit the fare there. So how was it? Low lit, usually much more packed. Disco music, anyone? First of all, it was uncharacteristically easy to get a seat. The place is routinely packed to the gills, and there’s often a line. My visit coincided however with Passover, so perhaps that accounts for some dropoff in traffic. The atmosphere inside Five Napkin is raucous. They play loud music of the disco variety. The clamor of people chat (and chew) loudly. The full bar keeps things lively. Croutons on top? A good sign... .
I’d like to sit here and rave about the mac n cheese, but I’m afraid it was a bit forgettable. 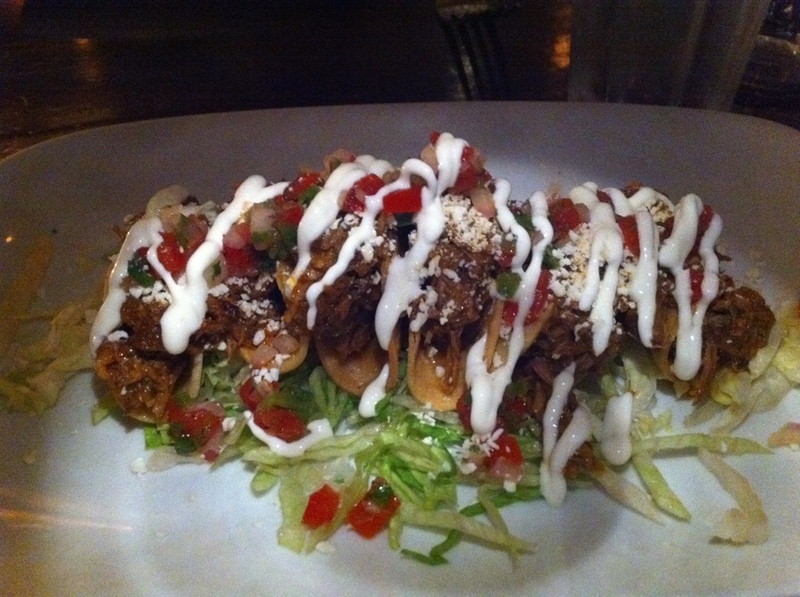 I liked the use of crunchy croutons, and the bits of scallion atop it are also good. But flavorwise it didn’t register that much, one way or another. Perhaps that is because it is a mixture of gruyere, parmesan and cheddar. There was some sharpness to the cheddar… . The best macs I have found rely heavily (if not exclusively) on cheddar. I may have to give it another try to really give it a more thorough review. A forkful. 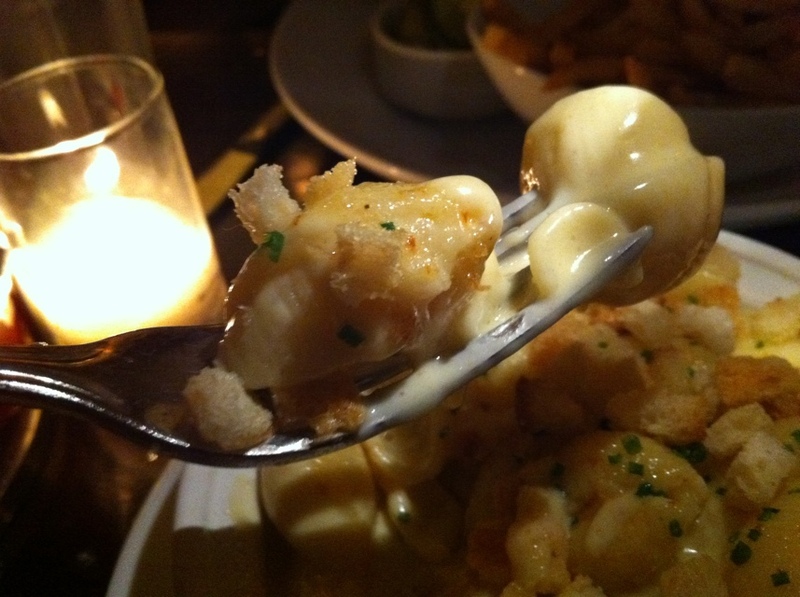 Note the liquid-like nature of the cheese. 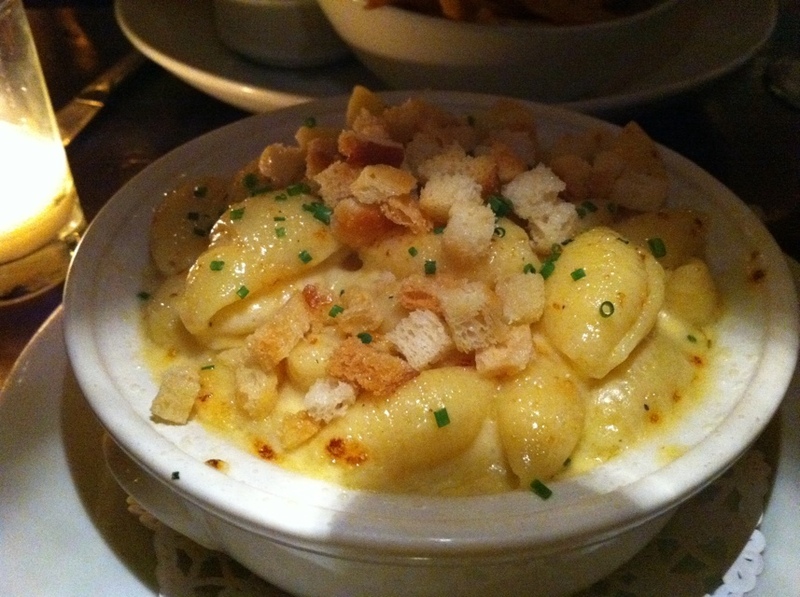 You can however clearly make out the gooey and runny nature of the cheese. Either way, all of this is just prelude to the main: the 5 Napkin Burger itself. So the easiest way to understand a Five Napkin Burger is to think of it as an onion soup burger, though there is perhaps a bit more going on with it than that. 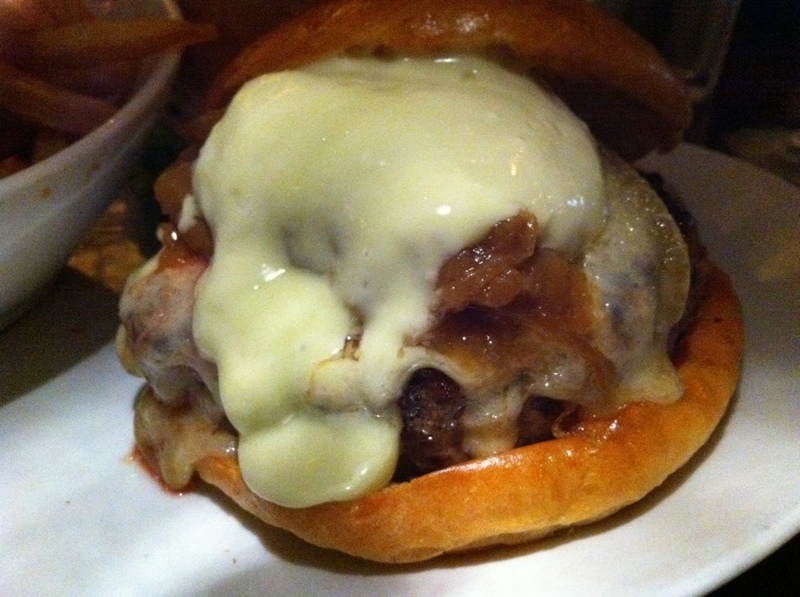 It consists of 10 ounces of what they call custom ground beef, a slathering of gruyere, caramelized onions and rosemary aioli. All this sits on top of a soft, white roll. It is a very large burger – a serious amount of food. It really does seem to me that they’ve taken delicious beef, dunked it in a batch of onion soup, topped with gruyere and served it. 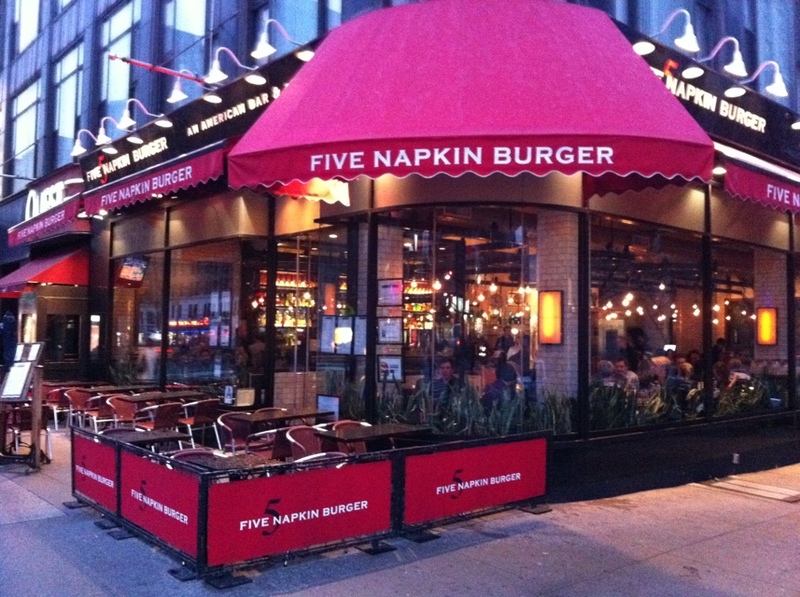 But why call it a “Five Napkin” burger? How'd the cheese get outside the bun? That’s why. It is a dripping mess to hold. It is so flooded, soaked and sopping that it is hard to hold. It’s like eating a burger in the rain. The gruyere flavor adds a lighter quality to the otherwise heavy, beefy flavor. There is also, interestingly, a resonant mustard note. While some burgers come with salt and char flavors, this one comes with slime and juice. It is a massive burger, but seems almost too eager to try and prove itself worth its whopping $15 price point – which also makes it one of the more expensive burgers going. 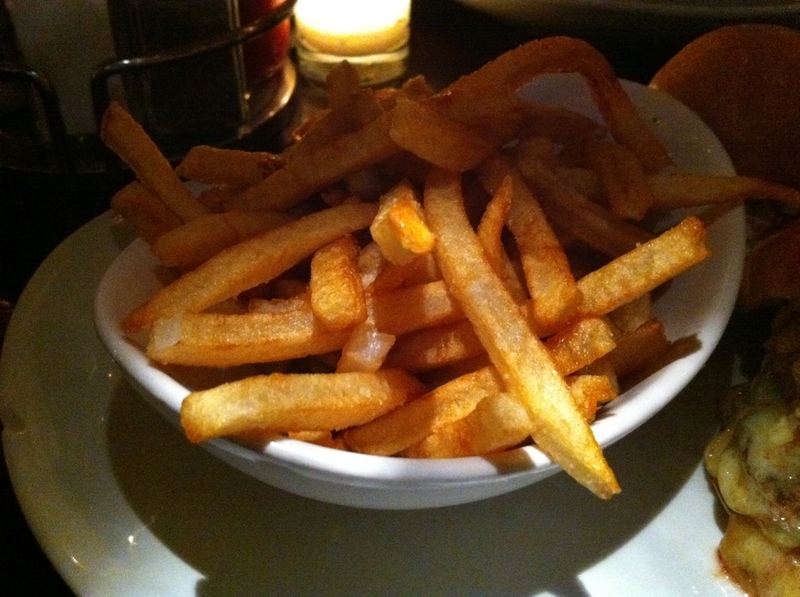 The fries were very straightforward and good. Salty and slim. With drinks, our meal came to $120 after tip for two people. That’s a lot of money. Granted, the burger is substantial, and there is definitely some highly respectable craftsmanship at work here. 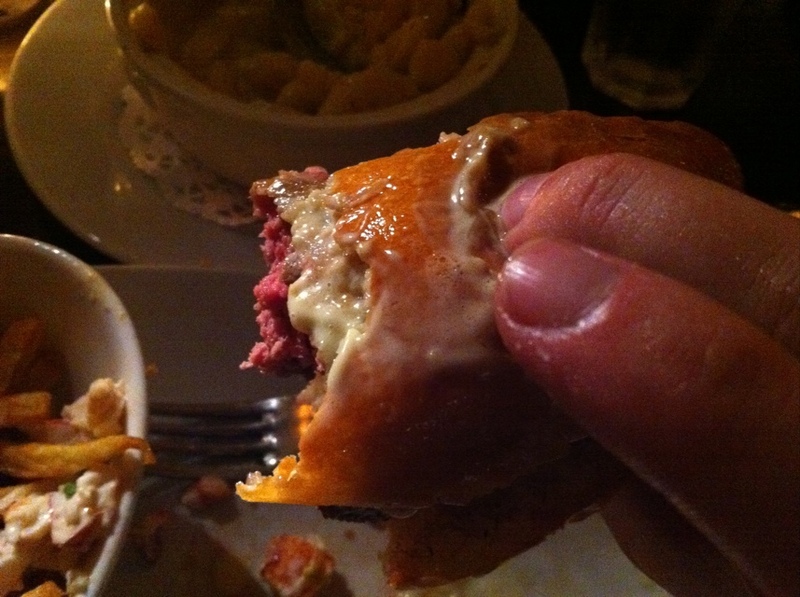 But the rest of the meal, and the $15 per burger price point… I don’t know. It didn’t quite deliver. It’s a fine burger, feel free to try it. But really, go to Mel’s. I’m also fan of the Five Napkin burger or, as I call it, the Fork and Knife burger. $120 for two?… Seems high. What did you order? I neglected to mention the booze involved. Still, the meal was as you saw it. We drink, but not THAT much. What kind of burger joint won’t sell you a simple cheeseburger? Speaking of, review of Big Nick’s coming soon. Preview: still rock solid.